The introduction of wireless connectivity in industrial environments promises a rapid and cost-effective reconfiguration of machines and sensors. A key question in this context is: Which wireless technology is best suited for industrial settings? Many of the prevalent technologies, like WiFi and ZigBee, do not meet the requirements of certain industrial applications in terms of data rate, power consumption, and robustness. The lack of alternatives capable of achieving a good balance between these conflicting goals impedes progress. This is why researchers from the University of Klagenfurt, Airbus, and Lakeside Labs investigate the use of ultra-wideband (UWB) communications for wireless connectivity in industrial environments. Interestingly, UWB is commonly used for localization but is not yet an option for communications. 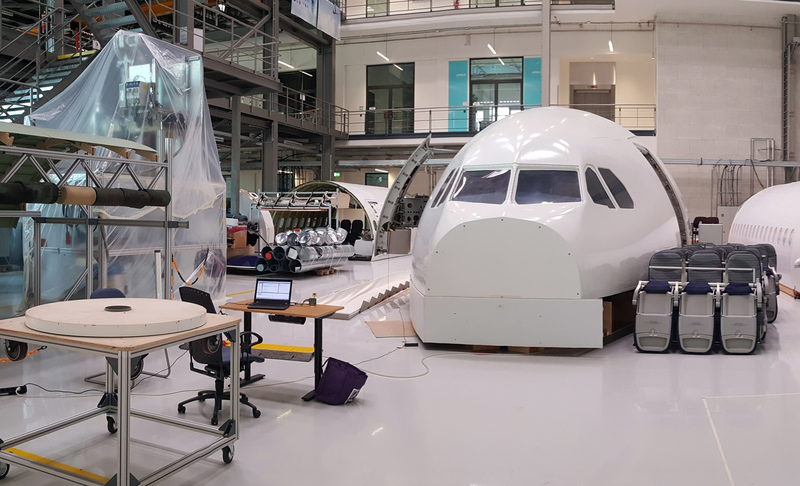 Experiments with IEEE 802.15.4-2011 UWB devices were conducted in two industrial scenarios, namely a large-size aircraft assembly hangar and a medium-size production hall. These measurements are the first ones reported for off-the-shelf UWB devices in such setting and shed light on the potential of UWB to support emerging industrial applications. These results—together with inherent features, like robustness against narrowband interference and localization capabilities of state-of-the-art transceivers—position UWB as a promising radio interface to support emerging industrial applications. The discoveries of the research team will be presented and published at the European Wireless conference in Catania (Sicily, Italy) in early May. The work has been funded in part by the Kärntner Wirtschaftsförderungs Fonds (KWF). Utilizing UWB for industrial applications like condition monitoring will be investigated in more detail in a recently commenced project that includes various industrial and research partners and is funded by the Austrian Research Promotion Agency (FFG). J. F. Schmidt, D. Neuhold, J. Klaue, D. Schupke, C. Bettstetter. In Proc. European Wireless, Catania, Italy, May 2018. Download preprint. This post is based on the abstract and introduction of the mentioned publication written by all authors. Photo made by Daniel Neuhold at ZAL Zentrum für Angewandte Luftfahrtforschung with kind permission.